Mary is a young girl, likely only 12 or 13 years of age. She is betrothed to Joseph, which means, among other things, the bride price has been paid. By our accounts, they are “married” but Mary will continue to live with her family for a year before the marriage is consummated. In essence, Mary is living in an “in between” time, caught between life as a daughter and life as a wife. Then one day, Gabriel appears with a message for this young girl—a girl with no outstanding pedigree and little to offer—it seems. “Greetings, favored one, the Lord is with you,” the angel declares. “The Lord is with you.” These are the same words spoken to mighty warriors like Gideon and to godly prophets like Moses and Jeremiah when they are called by God to do extraordinary things. “The Lord is with you.” Following these words, I imagine there’s a great pause…and then…and then…the commission. “Do not be afraid, Mary, for you have found favor with God…you will conceive and bear a son, and you will name him Jesus.” Mary is called by God to bear a child—but not just any child, God’s child. “How can this be?” When Mary raises a question, as nearly all prophets do, she is reassured that God is at work and, ultimately, will be glorified when the Holy Spirit overshadows her with the resulting birth of the Son of God. If these words of assurance aren’t enough, like Gideon, Mary is given a sign. The angel Gabriel directs her attention to Elizabeth—old, barren, yet in her second trimester! You see, nothing is impossible with God. Mary is called to do an incredible thing. If unwed pregnancy attracts gossip today, imagine what it would have been like in 1st Century Nazareth. Nevertheless, she responds, “Here am I, the servant of the Lord; let it be with me according to your word.” Mary joins her voice to those of Abraham, Sarah, and Isaiah: “Here I am.” Mary says, “Yes,” to her mission of motherhood. Mary says, “Yes,” to her vocation to become the Bearer of the Light of the World. I invite you now to listen to a children’s story—one that captures the essence of bearing light for the world. Written by Richard Paul Evans, it is entitled The Light of Christmas. The Keeper of the Flame offers Alexander the invitation to “Light our Christmas, dear boy, light our Christmas.” It’s an invitation for us as well—to continue to light Christmas—to be lights of hope and peace for those who sit in darkness. While reading Cynthia Bourgeault’s The Wisdom Way of Knowing, I came across something that might help us see our role in God’s salvation story a little more clearly. Imagine this candle—it is made of wax and wick—simple enough. [Candle is placed on the pulpit and a match is struck.] 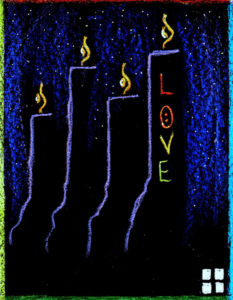 But, the energy and effectiveness of the candle is revealed when the match is struck and the candle begins to burn. Only then can we see what it really is. While its outer life is nothing more than wax and wick, its inner life is flame. Becoming flames for God, giving light to the world, well, it will cost us. But as we are “burned up” for the love of God, we become the people God yearns for us to be. Through the flame of the Holy Spirit burning bright within us, we are transformed, thereby shining forth generosity and love and kindness and mercy. Maybe we think we don’t have the resources to burn brightly for God, but Mary, the bearer of Light, had little to offer—except herself. And remember, God did not send Gabriel to a queen or a princess, but to a young girl engaged to a carpenter. Our Abba Father—well, God has a fondness for working through ordinary people to do extraordinary things. Today, on this 4th Sunday of Advent, on this Christmas Eve morn, I invite you to ponder how you might carry forth the light of Christmas into the world. Is there someone in your life who needs a word of encouragement? A reminder of God’s amazing grace? Too readily, we look at the brokenness all around us and we feel overwhelmed. But God doesn’t call us to light the whole world. God only asks that we start burning right where we are. So light our Christmas, dear Christians, light our Christmas!